As a junior in high school, I read the biography Edie: An American Life by Jean Stein and George Plimpton, so I knew she grew up on a ranch, the troubled scion of a privileged family, had been institutionalized at Silver Hill and sculpted a horse at Radcliffe. In 1965, she became the most glamorous of Warhol’s “superstars,” the one who best set off his own spectral image when they appeared in photographs together. I’d seen footage of her in Ciao! Manhattan balancing on a stone wall, a celestial tightrope walker; and later, a tragic burnout, camping at the bottom of an empty swimming pool. She died only months after the filming was complete, of an overdose of barbiturates, at the age of 28. To me, 28 seemed plenty old, and besides, I had a premonition that I would die in a car crash at that same age. Before then, I was destined to become Warhol’s last starlet: Edie Sedgwick reincarnated as a middle-class Jewish girl from Connecticut. I knew what I had to do to become Edie. First, I had to become as exquisitely, breathtakingly thin as she was. (I knew beauty was a prerequisite, too, but thinness you could take action on immediately.) Second, I had to get to New York. When I got there, Warhol would hire me to work in his studio, but would soon realize my destiny and make me a superstar. College was just a means of getting to New York; my real life would be in the Art World. I would make art twenty-four hours a day, and I wouldn’t need to sleep. Or eat. In college, it turned out that I was a complete coward about drugs. I refused uppers and LSD and cocaine and ecstasy. The couple of times I tried it, pot had no effect on me—I wasn’t a smoker, and didn’t get how to inhale. I couldn’t teach myself to like beer, and besides, the tiniest amount of alcohol of any kind made me lose control, which I couldn’t stand. So I didn’t drink, either. On the other hand, I discovered that I liked hiding in the library and reading Hegel for seven hours straight, copying long passages into a notebook. So much for glamorous death by overdose; on with the life of a closet nerd. Last week, I was standing in line at Whole Foods and my eyes came to rest on a refrigerator magnet, for sale near the checkout. It had a quote attributed to Thoreau: “Go confidently in the direction of your dreams. Live the life you have imagined.” Because I was stuck in line, I occupied myself by trying to parse the nausea that came over me when I read that quote: Maybe it was the never-ending list of times I had failed to go confidently in the direction of anything, let alone my dreams. Maybe it was the recognition that, in middle age, the most we tend to do is glance ruefully in the direction of our dreams. Although I thought about transferring somewhere downtown, I stayed at Barnard and, in the long run, would have been happy to spend my entire life at Columbia. Gradually, the dream of being Warhol’s last starlet gave way to other fantasies—less vain perhaps, but just as impossible to realize. I never had a name for this kind of sustained, elaborate fantasizing about another existence. It seems like someone should have invented the term “the unlived life” long ago—but no one did. 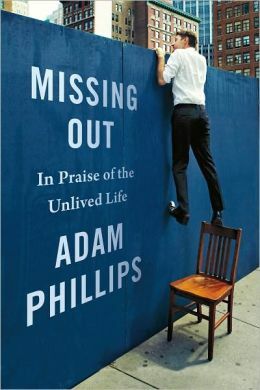 We had to wait for Adam Phillips and his recent collection of essays, Missing Out: In Praise of the Unlived Life, in order to find the phrase. We refer to them as our unlived lives because somewhere we believe that they were open to us; but for some reason—and we might spend a great deal of our lived lives trying to find and give the reason—they were not possible. Indeed, our lived lives might become an endless tantrum about the lives we were unable to live. But the exemptions we suffer, whether forced or chosen, make us who we are. It is, then, a very real risk that our unlived lives may become an unhealthy preoccupation, an endless source of sorrow or rage. Phillips suggests that we might take an interest in these imaginary lives without becoming entangled in a protracted mourning for them. Losses, as well as achievements, he reminds us, make us who we are. In one breath, he warns us about dwelling too much on what we might have been, and implies that the self is partly defined by loss. I find this enormously comforting: Just because I can imagine a different life doesn’t mean I should actually be living it. Just because I once thought I was special (My mother told me I was! My fourth grade teacher told me I was!) doesn’t mean I should have been a Warhol superstar. It is a relief to know that I don’t have to regard my unlived life as a sign that I am hopelessly riven; nor do I have to act upon fantasies that might be as destructive as they are compelling. We create unlived lives, Phillips suggests, in part to deal with the problem that we are “nothing special”—as a species or as individuals (especially not as individuals). From within a religious worldview, we can see ourselves as chosen by God for a special place in the universe, whereas Darwin placed us alongside animals. We are no longer “chosen,” set apart from other creatures. That’s an interesting view, but I find the individual, psychological viewpoint more compelling: It’s the job of parents to make every child feel unique and extraordinary; it’s the job of the world to undo this sense of specialness. After a certain magical, protected period in childhood, this is invariably what happens. One purpose of the unlived life is to recover this lost sense of specialness. Phillips observes: “We certainly tend to be more special, if only to ourselves, in our (imaginary) unlived lives.” I’ve tested this hypothesis, and it certainly accords with my experience. In my imaginary lives, I’m not necessarily famous, but I am special: a fearless oddball, a writer possessed by ideas, and almost always capable (this is a weird aspect) of living without love. It’s the fact of our own mediocrity that we can’t bear, and the unlived life offers refuge from this awareness. On the first page of Shapton’s Swimming Studies, we learn that she competed in Olympic swimming trials twice (in 1988 and 1992) but did not go on to the event itself. She has erased the details of her own failure, but remembers watching while a teammate, Beth, came even closer to making the team: “Beth had missed the qualifying standard by a hundredth of a second. A hundredth. I remembered her face, glazed, stoic, on the medal podium. It was like watching the bereaved.” At Olympic trials, lives bifurcate: the lived life continues in one direction, as the swimmer has to find a way to cope with devastating disappointment; the unlived life continues in another direction, in which the disappointment never happened and she goes on to win renown. It’s rare that you can pinpoint, to a hundredth of a second, the moment when a lived life divides and gives rise to an unlived life; Shapton specializes in this kind of melancholy precision. Swimming Studies is her lovely, mournful reckoning with her own unlived life. Ultimately, it is her husband James who grants her the realization that life doesn’t have to be about self-punishing discipline. James doesn’t see life as rigor and deprivation, and he introduces her to the idea of bathing. Bathing takes places in the water, but is the opposite of the punishing workouts Shapton endured as an Olympic hopeful. Plus, it sounds delightfully nineteenth-century. 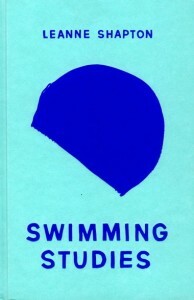 One of the joys of Shapton’s book is that she found someone who helped her understand that our focus doesn’t have to be on “how to win,” but instead on “how to flourish.” As a counterpoint to the strenuous workouts of her competitive swimming days, we also get to see Shapton “bathing”—playing lazily in exotic European pools. As a dedicated recreational swimmer, but never a competitive one, I have always looked into that other lane with awe and fascination—but not envy. Then again, I do envy what Shapton calls the “dumb focus” that characterized her life as competitive swimmer—but it’s not really dumb. It’s what she misses most, aside from the feeling of being special. Dumb focus reminds me of what The Baghavad-Gita calls the yogi’s “one-pointed mind,” a passionate dedication to just one thing. Dumb focus is perhaps the one quality that can save you from despair, or from a state of catastrophic distraction. So it didn’t surprise me that after Shapton gave up swimming, she was diagnosed with chronic depression. Maybe that’s just the absence of dumb focus. 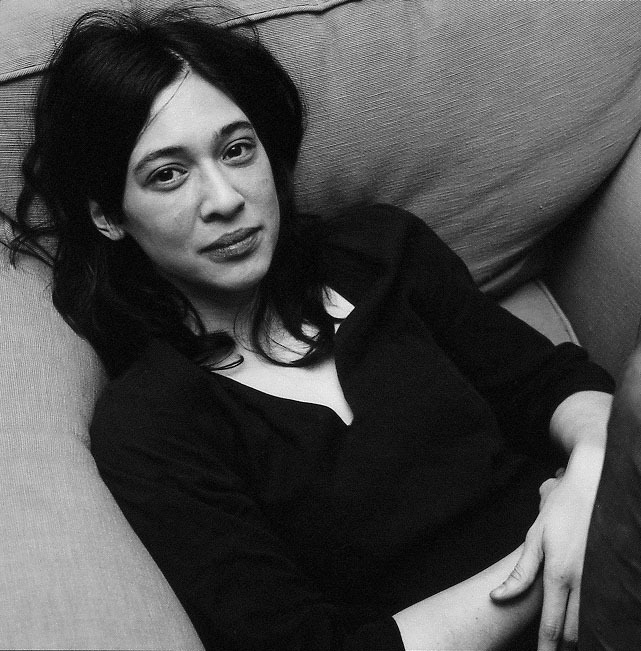 Reading, I wanted to believe that she simply transferred her ability for intense focus from swimming to the discipline of art, but this isn’t quite true—because she says she has spent twenty years trying to recover it. I wonder whether she did indeed recover it, to some extent, in writing this mesmerizing book. If the main narrative of Swimming Studies is about the “might-have-been,” Shapton is also attentive to the “what-actually-was.” The book’s main subject is the inner life, but there’s a subtler current involving the life of the body among things, the outer life, the tactile world. Shapton is fascinated by the texture of lived experience: taste, smell, and vision. For instance, there is the section titled “Fourteen Odors,” an inventory of peculiar smells emanating from swimmers’ bodies and hair and gear: “Duffle bag pocket” (“Tangy nylon, porcini. Hint of oats and semisweet chocolate chip.”); “Sit-ups partner” (“Tide, milk, terrier, and grape Hubba Bubba”). There’s also the eerie and poignant series of bathing suits, Shapton’s specters; her watercolors of shadowy, graceful figures in water; the ghostly shapes of pools where she swam; and the vivid pink and red contours of the Vals paintings, views of a town in Switzerland where she vacationed—and swam, of course. Like the nineteenth-century countess whose Stockholm castle she tours, Shapton loves and collects objects. Most prominently on display here are her swimsuits (yes, Shapton’s actual swimsuits, photographed on a dress form). Shapton presents the swimsuits as a token collection, a synecdoche for her excessive love of things. Like objects in a museum, each one is labeled with the date and place of purchase, and the occasions when the suit was worn. The suits serve as emblems of her inner world, objects that link her to a life that once was. At the same time, she clearly delights in them as aesthetic objects, completely separate from what they represent as relics from a lost time. I wonder, too, how often Shapton’s teammate Beth thinks about that hundredth of a second, as I think about that misbegotten master’s thesis on Emerson, or that teaching demonstration that drew blank stares—failures that carried me in one direction, while my fantasies went off in another. 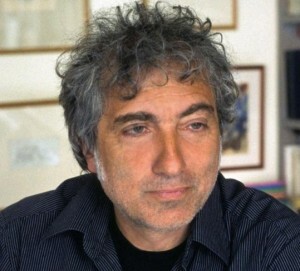 In the summer of 1998, before returning to New York and graduate school, I stayed in a Berlin apartment belonging to a young doctor and aspiring novelist named Gregor (the friend of a friend). He also had an apartment near the clinic where he worked during the week, so his apartment in the Kreuzberg neighborhood was empty. The apartment had two rooms: In one there was the bed, and in the other an enormous worktable made from a wood plank on horses, which was cluttered with mail and sketchbooks and empty cigar boxes. Around the perimeter of the room, just below the ceiling, was a string of German words: a surrealist poem. I looked for a long time at the framed drawing on the bedroom wall—one stick figure holding the train of a long cape worn by another stick figure, with the inscription Die Diener des Gegengluecks, the servants of counterhappiness. From the evidence in the apartment, I constructed an image of Gregor who, in my mind, was handsome in a Kafkaesque way (dark, soulful), brilliant, and sad. As a fellow servant of counterhappiness, I imagined us to be kindred spirits. When I went back to New York, I left Gregor a fervent note of thanks in my best German, along with an expensive box of cigars. 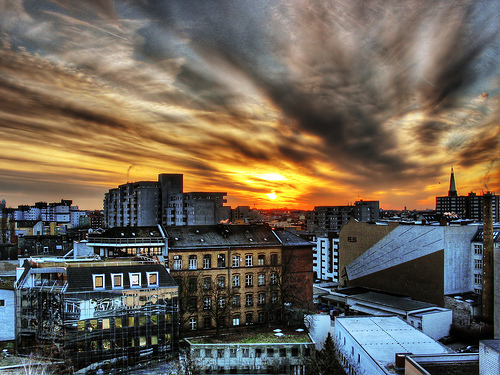 I stayed there only a few days, venturing out to visit museums and sit in cafés, but that apartment became the setting for a long-standing unlived life: I wanted (okay, I still want) to be a novelist living in Berlin. In Kreuzberg. I imagined this life vividly enough to sketch out the novel I would write: It would be called The Fifteen-Minute Red Review, a title borrowed from a Communist agitprop playlet I’d read while studying for a qualifying exam on political theater. It seemed a waste to allow that title to be consigned to theatrical history. My novel would be about a production of The Fifteen Minute Red Review, about Communist and Yiddish theater in New York in the 1930s. The heroine would be an actress and singer, the daughter of a Yiddish theater director; the hero would be a German Communist, in New York to work on the production of the play. Their romance would be complicated by the impending war (in ways I never quite figured out), but the narrator of the novel would actually be their granddaughter who—surprise!—was a writer living in Berlin. The experience of trying to write the novel (in New York, not Berlin) was a lot like trying to teach myself to like beer. I wanted the characters to be alive, for the voice to be poignant and funny. The pages I produced were lifeless, and before long, the prospect of working on the book filled me with dread. Well, I thought, perhaps it’s too hard to begin with a novel—how about a short story? I managed to complete a little piece about a Holocaust survivor and her relationship with a college student, but the story too was flat, and I knew it. And once again, real life—the offer of a job in New Jersey—pulled me forward, and the dream of living in Germany was never realized, either. I sometimes think that perhaps I should pick up The Fifteen Minute Red Review again. But if I need to be reminded of why I haven’t written a novel, all I have to do is: try writing a novel. But what about going confidently in the direction of your dreams? What about “live the life you have imagined?” The nausea that comes over me when I read the quote from Thoreau emerges from the sense that I am failing at this very moment, failing to step into my unlived life. What am I doing standing in line at the Whole Foods in Foggy Bottom when I could be on a train to New York? Why am I all gnarled with anxiety about staffing next semester’s courses when I could be sitting next to a philosopher in a Berlin café? But of course, I remain standing there in line, staring obediently at the board that eventually summons me to Checkout #10; I pay for the zucchini, the yogurt, and the snickerdoodle for my husband. I get on the Metro and go home. When I went to find out whether Thoreau had actually said such a thing, a concordance directed me to the final chapter of Walden. I took the volume from my shelf and remembered a day during the summer of my sophomore year of college, when I was reading that copy of Walden for the first time, in a laundromat at the corner of Amsterdam and 109th. It was a blazing hot day and the door of the laundromat was open for air, salsa was playing from a neighboring apartment, and I inhaled the smell of hot dogs from a cart on the street. I raised my eyes from the book to watch the stream of people passing on Amsterdam and was suddenly overcome by the purest joy. I was responding in part to Thoreau’s gospel of ordinary life: “Love your life, poor as it is. You may perhaps have some pleasant, thrilling glorious hours, even in a poorhouse.” (Read: You may perhaps have a mystical experience in a laundromat.) For a fleeting moment, I was conscious that my lived life was miraculous. I learned this, at least, by my experiment; that if one advances confidently in the direction of his dreams, and endeavors to live the life which he has imagined, he will meet with a success unexpected in common hours. (…) In proportion as he simplifies his life, the laws of the universe will appear less complex, and solitude will not be solitude, nor poverty poverty, nor weakness weakness. The dream Thoreau had in mind was not Edie’s life of decadent thrills: it was hoeing beans, listening to owls, and shaping sentences. Here’s my hundredth of a second, the instant when I missed my other life: I did meet Andy Warhol, once, in the winter of 1985. It was on the street, outside the Whitney Museum, where we had both seen a retrospective of Jonathan Borofsky. He was standing and chatting, surrounded by a small entourage. I shyly approached him and said: “I came to New York because of you.” We shook hands, and he gave me a copy of Interview magazine from a bunch he was carrying under his arm. I saw him once more after that, in the summer of 1986, walking in Central Park with Jean-Michel Basquiat. A year later, in February 1987, he died. SANDIE FRIEDMAN has had three lives so far. Life 1: artsy kid and teenage punk rocker in the suburban idyll of Weston, Connecticut; Life 2: tightly-wound student of literature and American Studies in New York City; Life 3: happily married professor and proud stepmom in Washington DC. Currently in her third life, she teaches writing at George Washington University and at the Washington Center for Psychoanalysis. I’m the first to comment? Something’s wrong out there. This is a wonderful piece, especially for an old guy who does the “what if I’d . . .” more than he ought to. Thank you, Don! Glad you enjoyed the piece. What a lovely essay. I’m going to track down both these books. Gorgeous, thoughtful essay. Thank you for writing it. The Jonathan Borofsky exhibit at the Whitney was the catalyst that changed my life from the unlived to the lived. It was the beginning of giving up the dream of what my parents thought my life should be, and the life I would carve for myself. It took years, a lot of despair, hard work and coming to terms, but so well worth it. Another wonderful essay, Ms. Friedman. I wonder if we were at that exhibit on the same day! I’m certainly a fan. What a beautiful essay. As I settle into middle age, I find myself still daydreaming about those lives unlived. Thank you for understanding the wistful pain that accompanies the speculation. I love this essay, and the other of yours I’ve read here at TNB. I too toted Edie’s biography around with me and remade myself (or tried to) in her image. If you write a memoir, I’m first in line to buy it. Thanks for this, Very Insightful 🙂 Any relation to Milton, David, or Tom (Friedman)? 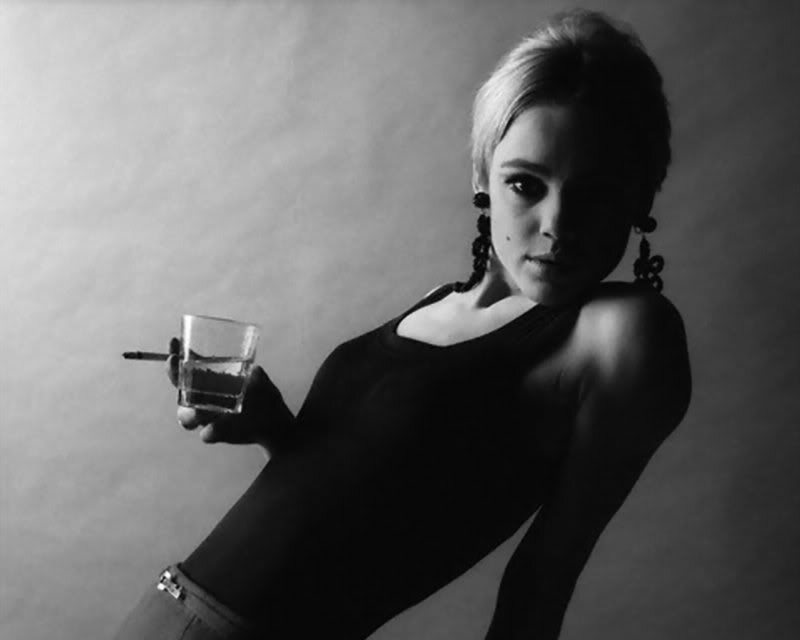 Thanks for sharing your thoughts about edie sedgwick.